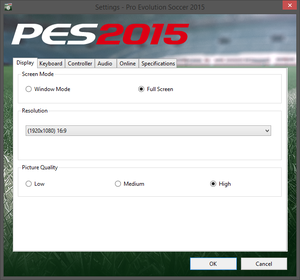 No graphics options in-game, all video settings must be changed with <path-to-game>\Settings.exe. Requires an internet connection to launch (Steam offline mode does not work). myClub mode progress are stored in the game's server. There is no way to change individual graphic options. Non 16:9 resolutions are selectable but letterboxed. 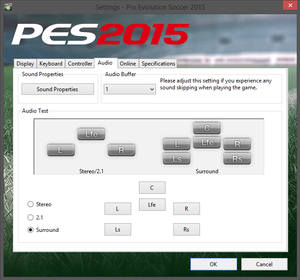 Use the Resolution Changer tool. Different camera angles available in game. 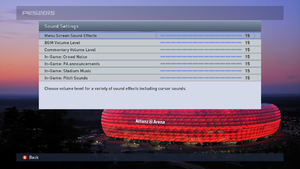 Can be forced on up to 16x through video card control panel. Enabled by default; see Vertical sync (Vsync). Open the game profile from Nvidia Control Panel or Nvidia Inspector. Configuration tool requires mouse input. No specific option but you can change the analog bindings it's invert. 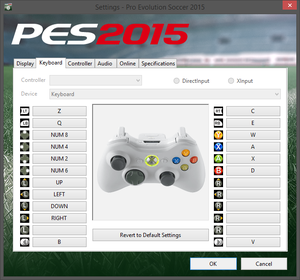 Selectable in the configuration tool. 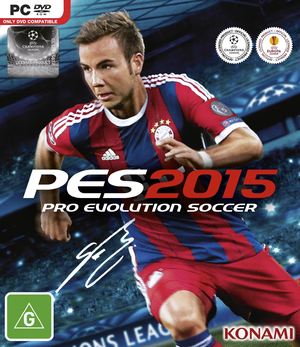 See Helix Mod: Pro Evolution Soccer 2015. ↑ 1.0 1.1 File/folder structure within this directory reflects the path(s) listed for Windows and/or Steam game data (use Wine regedit to access Windows registry paths). Games with Steam Cloud support may store data in ~/.steam/steam/userdata/<user-id>/287680/ in addition to or instead of this directory. The app ID (287680) may differ in some cases. Treat backslashes as forward slashes. See the glossary page for details. This page was last edited on 28 September 2018, at 13:09.